I've been wanting to do a post like this for a while but never got round to it. 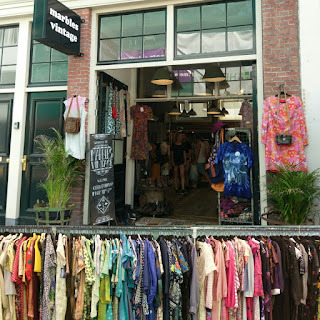 I thought it might be of use to some people who visit Amsterdam and want to do some (pre-60's/70's) vintage shopping. I am often asked where I buy my clothes and friends sometimes ask me to go vintage shopping with them because I have the name of having an eye for it. 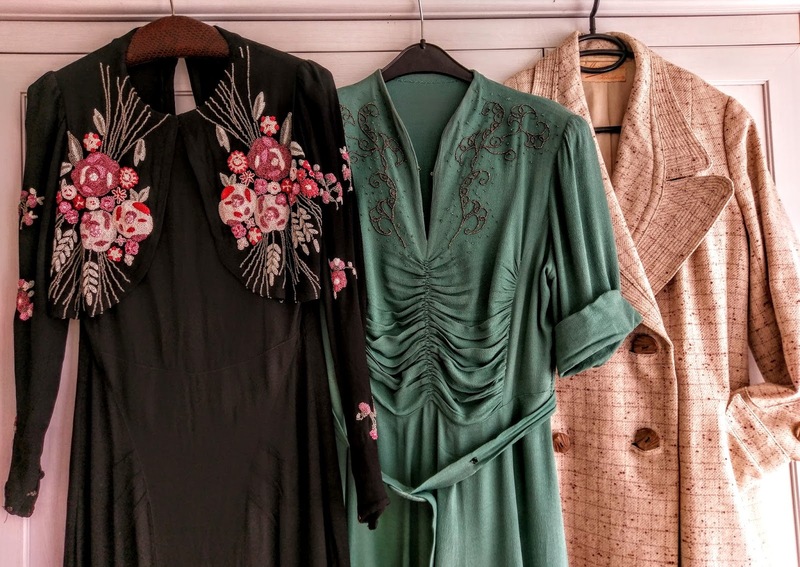 I love going with them and look at clothes, but I think knowing where to go is just as important as being able to recognize a vintage piece. 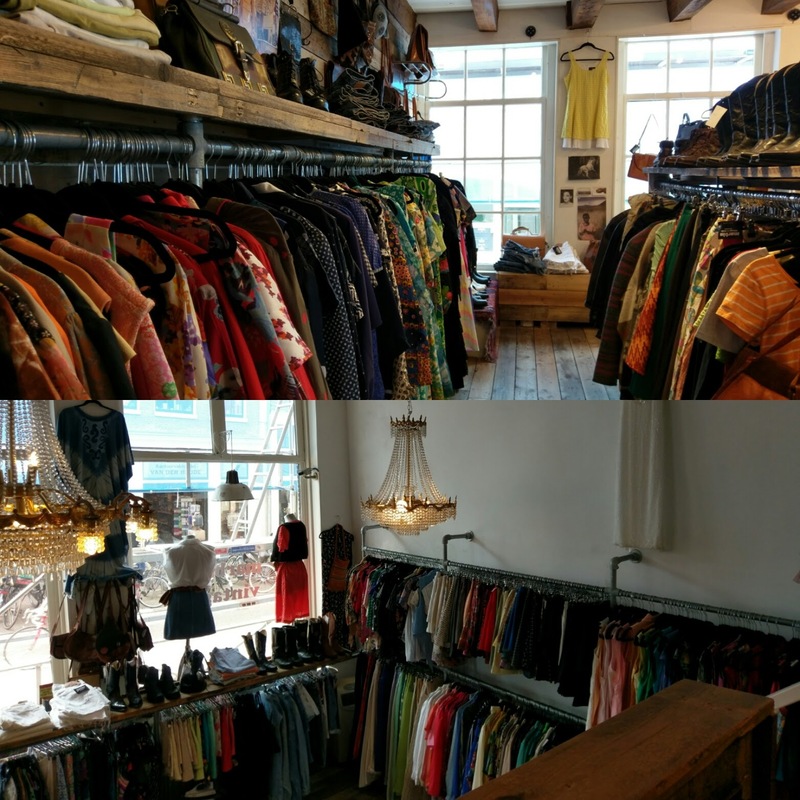 In my opinion Amsterdam is quite a good city for vintage shopping. Maybe not as grand as London or Paris but prices are much more affordable! So I thought I'd make a little shopping guide on this blog, to share my knowledge with all the people I cannot show around myself. 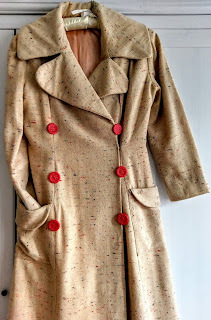 I will concentrate on shops where you can find pre-60's vintage, and where I have bought clothes myself. Naturally the focus will be on women's wear because I'm a girl. I will discuss the shops I think most interesting & post a pic of something I found and what I paid (if I can still remember) so you can get an idea. Below you can see a map of Amsterdam with 4 areas in a colored square, of each of these I have a more detailed map. 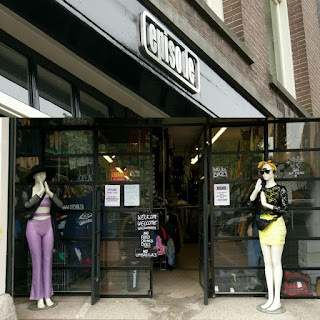 The thing with Amsterdam is that many things are within walking distance of each other. Technically speaking you could do all the 15 shops in one day by foot but if you have less time I suggest you pic an area to get as many shops in a short time as possible. I will start with the Waterlooplein and surrounding area near the Nieuwmarkt in the city centre. This is where I really started collecting vintage when I had just moved to this side of the country for my studies in 2008. I have one particular stall I prefer and where maybe about 50% of my vintage wardrobe was bought. Prices are fair, though not extremely cheap, but I've found the best things here. 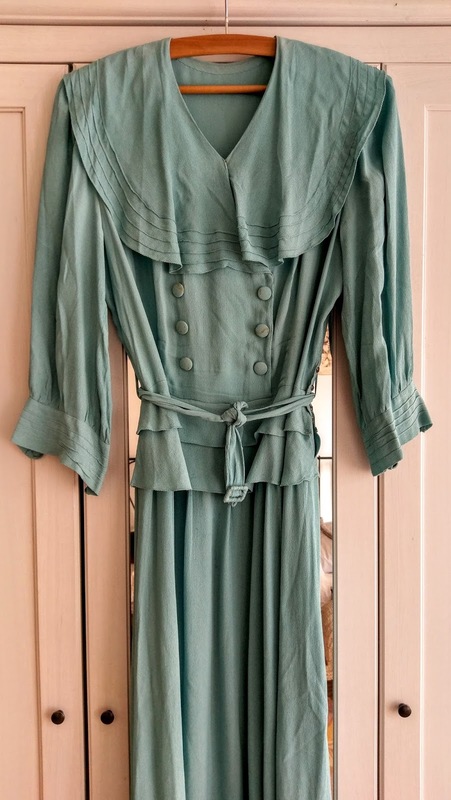 Expect to pay about 40-50 euros for a pre-war dress. This favorite stall of mine is situated on the waterside almost opposite the city hall entrance. It is not open every day, Saturday is your best chance of finding it open. 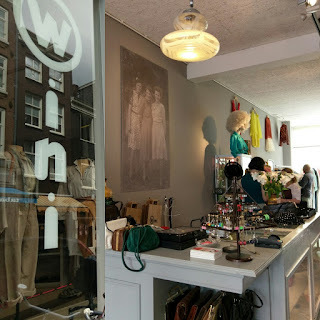 The Waterlooplein has been the place to shops vintage for decades, in recent years however there are less and less 'fleamarket' stalls and more and more cheap souvenirs being sold. One of the negative results of Amsterdam becomming a tourist city. 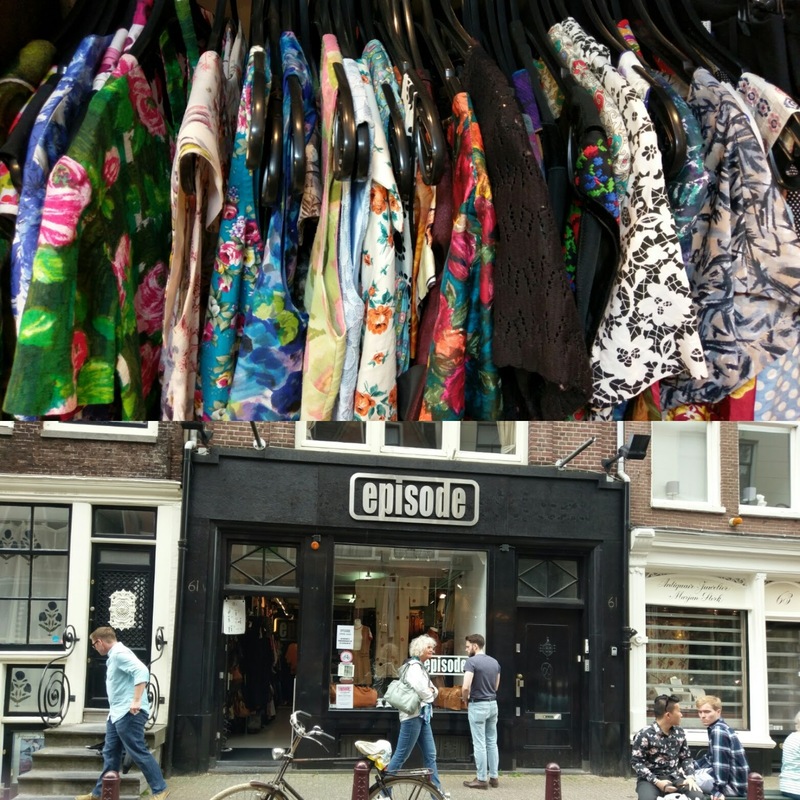 On the Waterlooplein there is a branch of Amsterdams biggest chain of vintage shops: Episode. 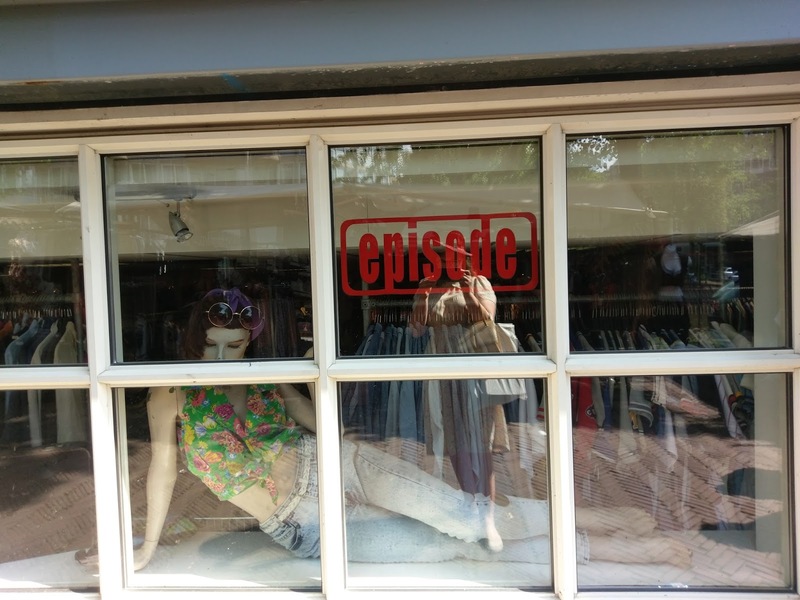 Episode has shops in several European countries. 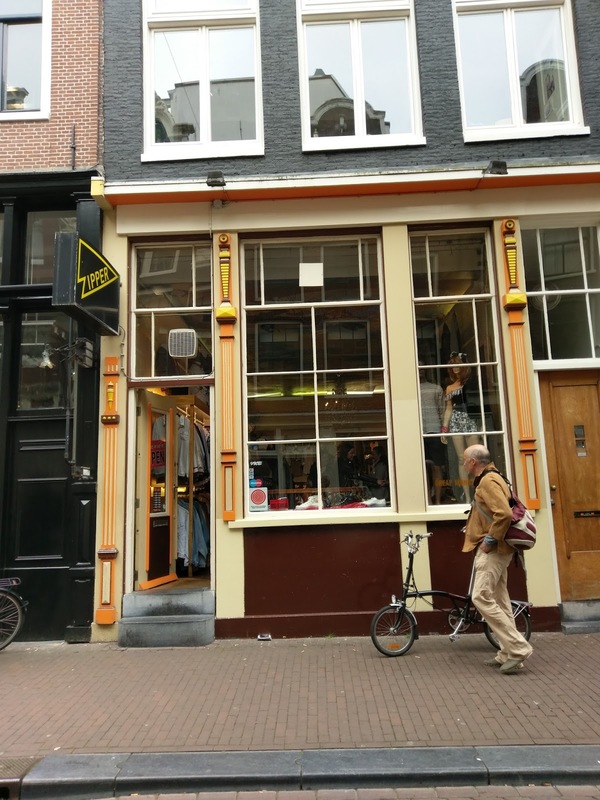 It has 5 shops in Amsterdam alone. 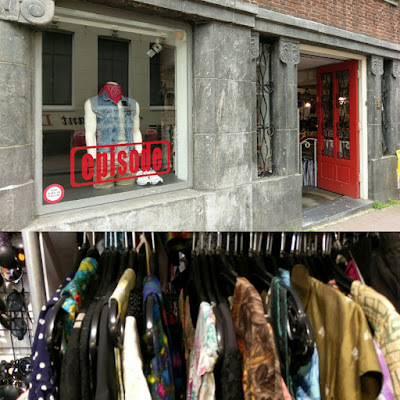 They mainly sell hipster oriented 80's & 90's second hand clothes. 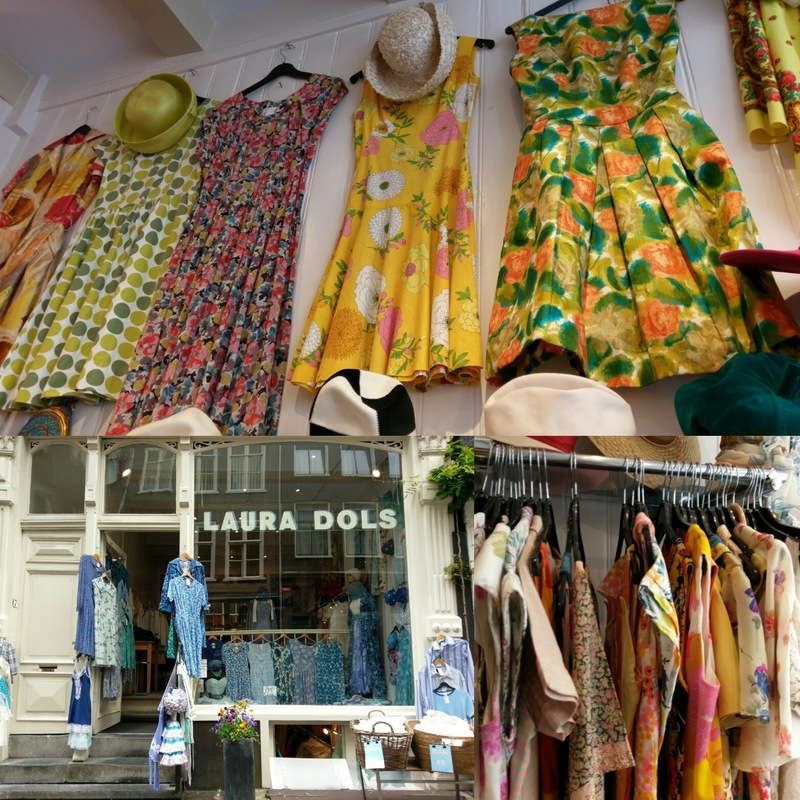 The good thing is that every shop has one rack of 20's-60's dresses at a fixed price of 35 euros. So don't be taken aback by the overall 80's feel. 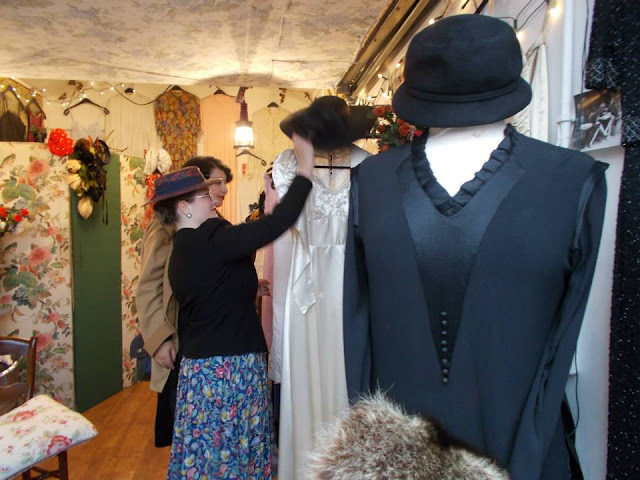 If you cannot find the specific rack of dresses it might help to ask for the 'antique' (that is what they call it) dresses. Bis has several shops in a row. The best one for me is the one with the shoes & purses. They sell an amazing amount of snakeskin and leather. At the back of this shop there are also dresses, some of which are pre-60's. 1940's rayon dress with sailor collar: think I paid 40 euro's. 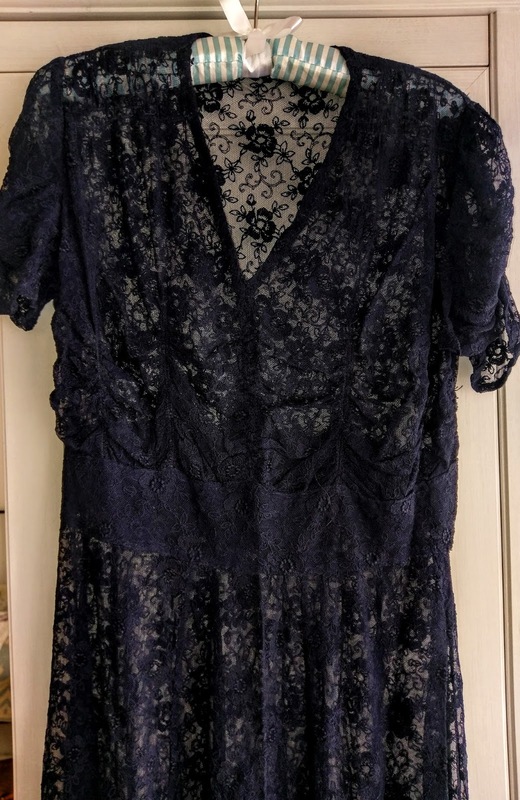 Most of the time I do not find anything here, but they usually do have several older dresses. 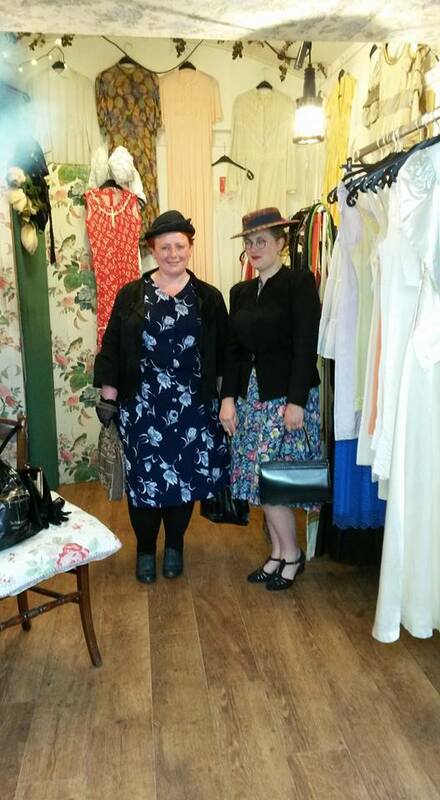 If you are into the 50's-60's it is a very good shop. There are two more 'Marbles' shops in other parts of he city but more on that later. I was in serious doubt whether to include this shop. Most reviews are raving but my feelings are somewhat mixed. Sure: It looks beautiful, they have amazing pieces form the late 1800's onward, but I don't have very good experiences with this shop. The first thing I've heard from the shopgirls seconds after entering is 'be carefull these things are very old'. 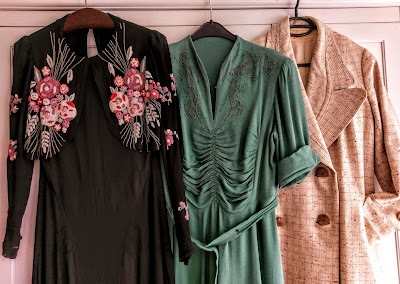 Quite annoying when you are dressed in vintage just as old (like I'm walking in with scissors in hand ;)) I am always made to feel unwelcome, up to the point that they are plain rude. Because prices are so high (5 to 10 times what I pay at most other Amsterdam shops!) I'm always dissapointed. I won't say don't go there, but be aware that there are no bargains to be had. 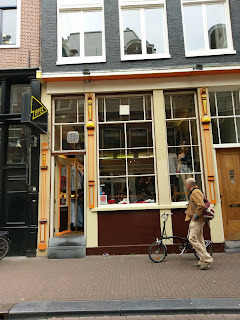 Extra: If you are into sewing it might be worth to visiting A. Boeken in the Nieuwe Hoogstraat. It is a very good shop for fabrics and haberdasheries. 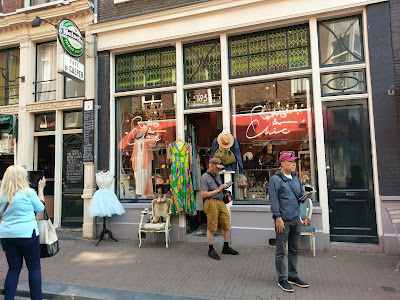 There are some more vintage shops in this street as well. 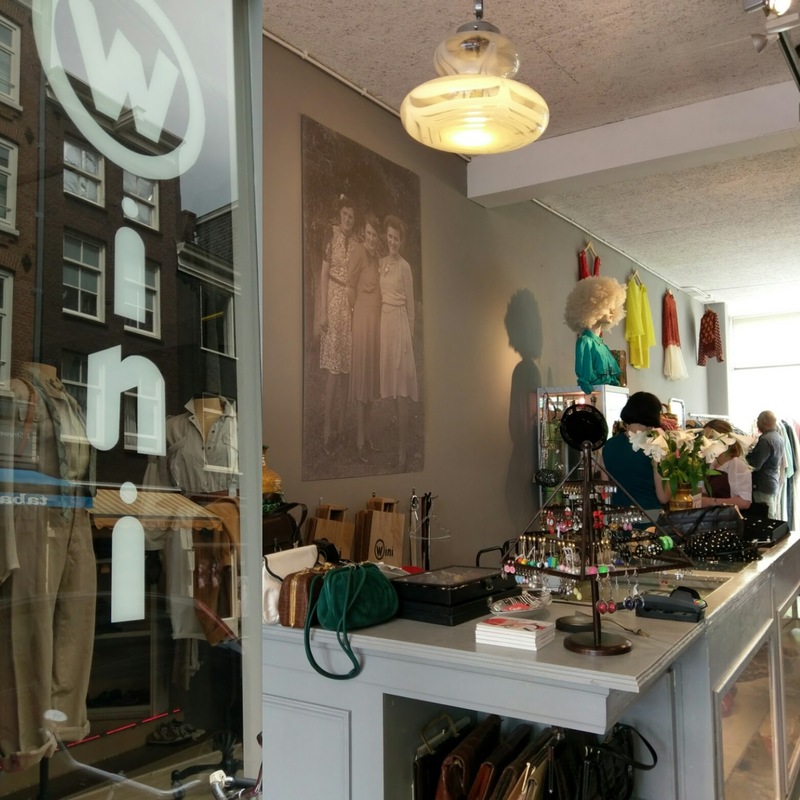 The next area would be ideal to visit after a visit to one of Amsterdam's museums on the museum square. There are two Episode shops close to each other in the Spiegelkwartier, where you can also find a lot on antiques shops. This branch has recently opened and also sells art. Prices for vintage are the same though. 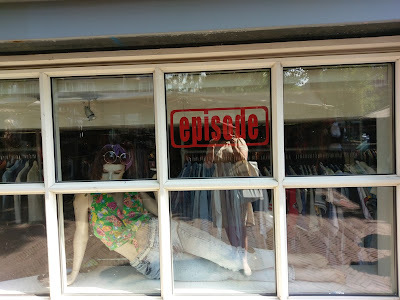 This Episode might be the most pleasant to shop as it is not as crammed as the other ones and I've found the people working there so very nice and helpful. I've bought this dark blue eveningdress and 1940's daydress with bright red soutache there. Both cost 35 euro's. Across the bridge on the is another Episode. 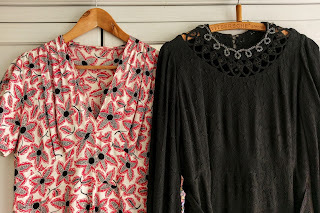 Concept is the same: one rack of old dresses. 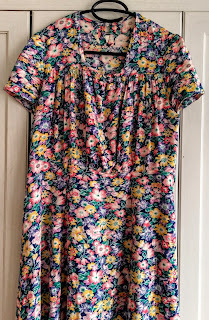 It's where I bought this cotton floral for 35 euro's. Another Marbles shop. 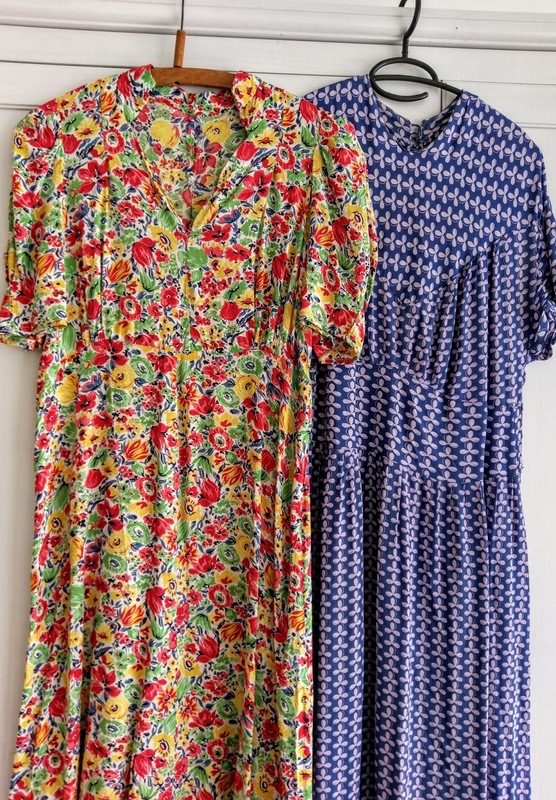 Between the 70's dresses are many hidden gems from earlier periods. 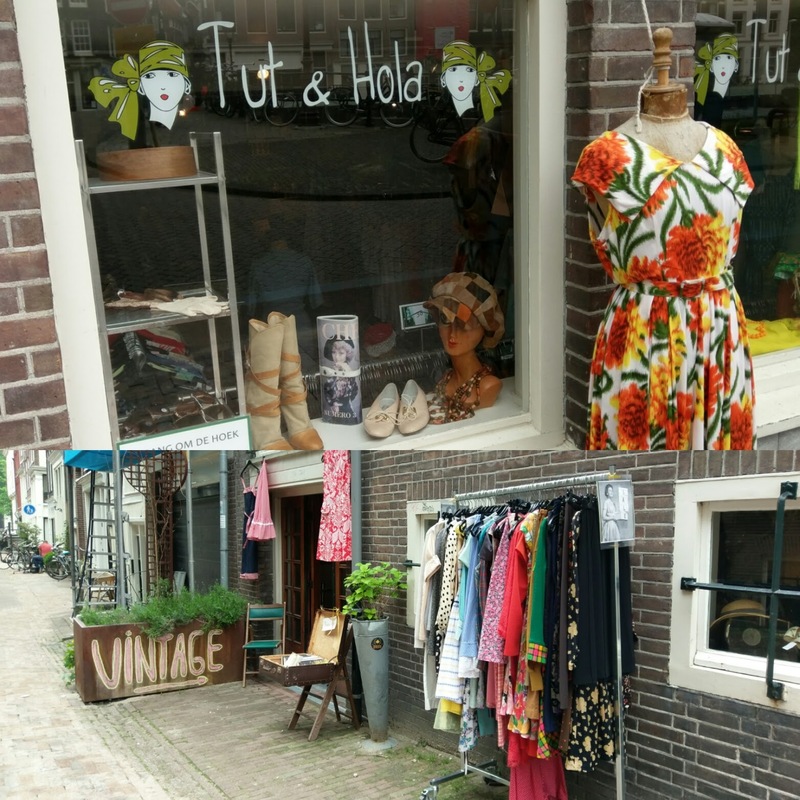 Extra: again for the seamstresses a visit to the Albert Cuyp market might be worth your while. A lot of fabric is being sold here. 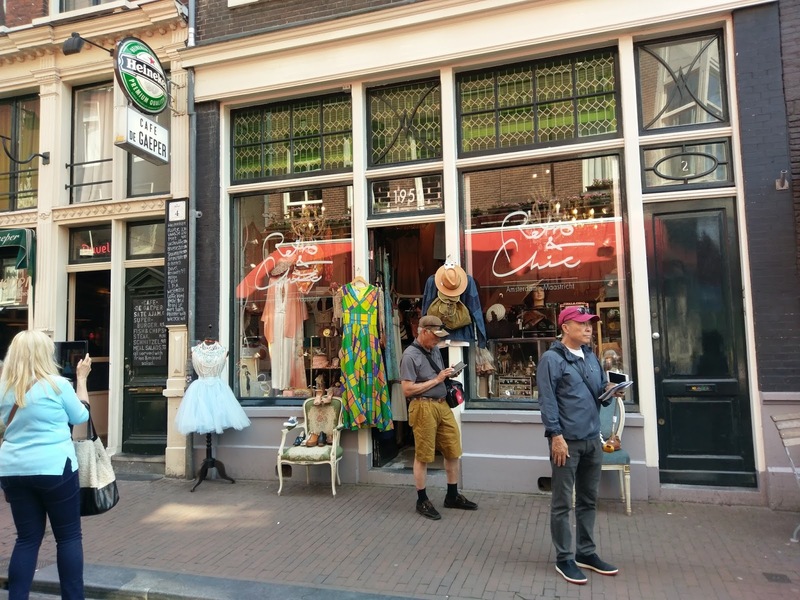 Visit 'De Boerenbonthal' for a wide variety of fabrics, 'Silk Route' for an amazing amount of silk fabrics for reasonable prices and 'Jan de Groot Kleinvakman' for haberdasheries. 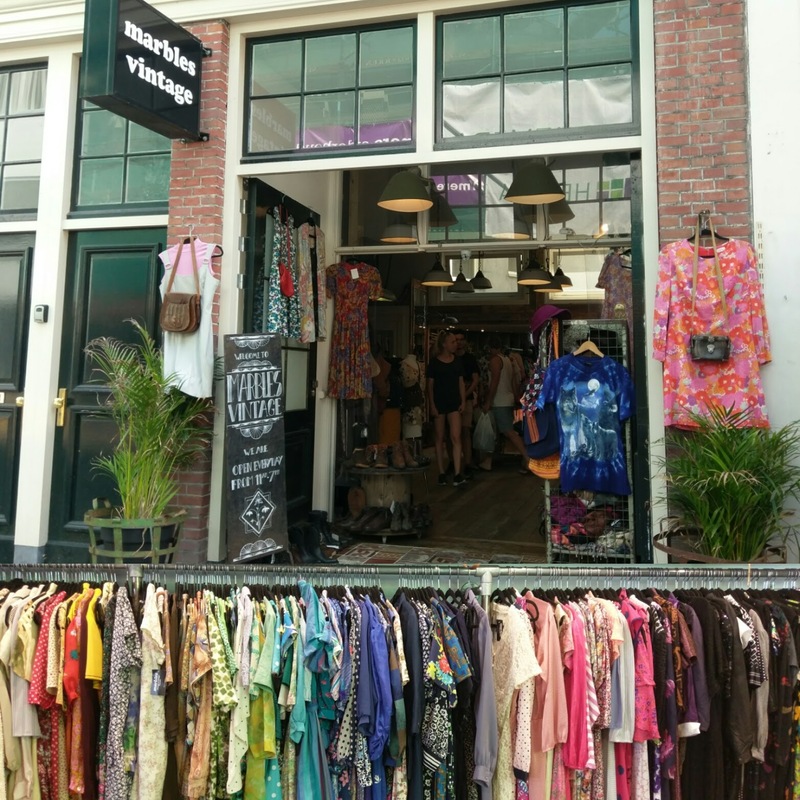 On to one of the best known vintage shopping areas in Amsterdam: the '9 streets' district. The most famous vintage shop in Amsterdam, and for a reason. It has a truly great selection of dresses and accessories on several floors. Prices do vary quite a bit. Some eveningdresses might cost several hundreds of euro's but you can also sometimes find a nice daydress for under 50 euro's too. 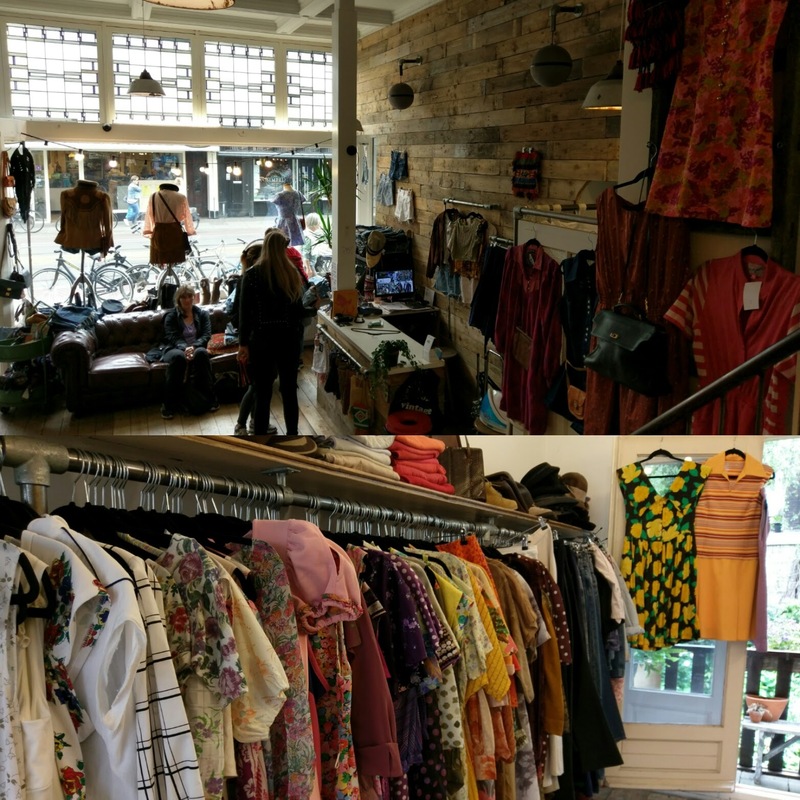 If you go vintage shopping this is a must see. 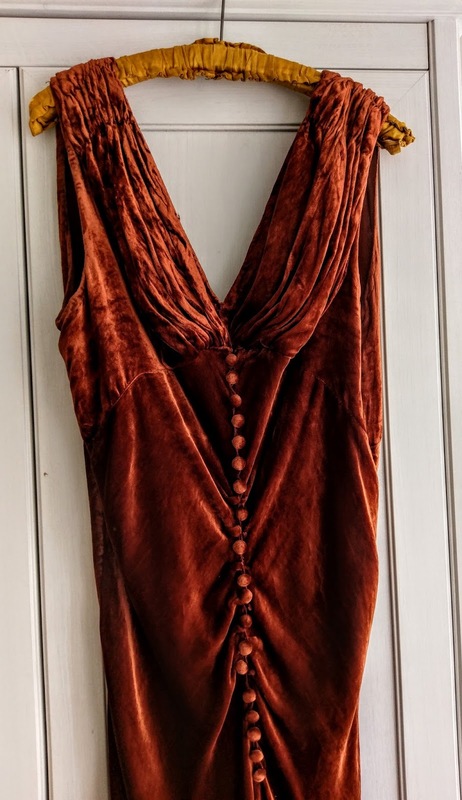 I've found this magnificent liquid silk velvet 1930's evening dress there. One of my most expensive buys: 150 euro's, but so worth it! This used to be my favorite Episode and also the largest with two floors and the biggest rack of 'antique' dresses. They recently closed the upper floor and the rack is a lot smaller. Still totally worth a visit. 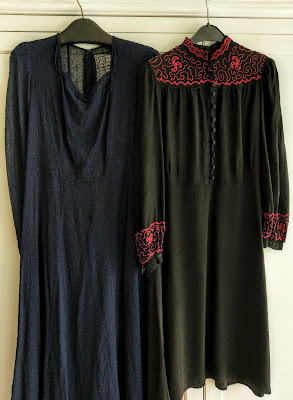 Among the things I've found there: 1940's cotton summer dress and black crepe rayon number from the same era. Both at the 35 euro fixed price. I don't usually go to Zipper a lot. Most stuff is much too new for my taste. But you can be lucky! A friend tipped me this 1940's coat was hanging in the basement and I went to get it the next day. Don't remember exactly how much I paid but it was not too much, for a coat. From the 9 Streets it is only a short walk to the Haarlemmerdijk/straat another vintage hotspot. Along the way are some more adresses worth visiting. 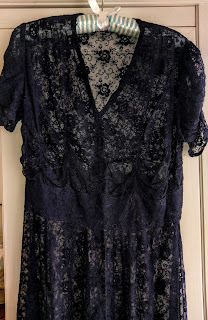 I found this lace dress there. It had some holes so I got it for 30 instead of 35. The salespeople cannot give huge disounts due to shop policy, unfortunately. They will also tell you anything pre-60's is antique, so allowed to be dammaged. A charming shop, run bu a mother and daughter. They have a very good selection but prices are often a bit too high for me personally. Not unreasonable though. Because this wool bahting suit had some dammage I got it for about 20 euro's. They also have a rack of 'sale' items outside. The older pieces on this tend to have some dammage, so if you are good at mending you can find a bargain. 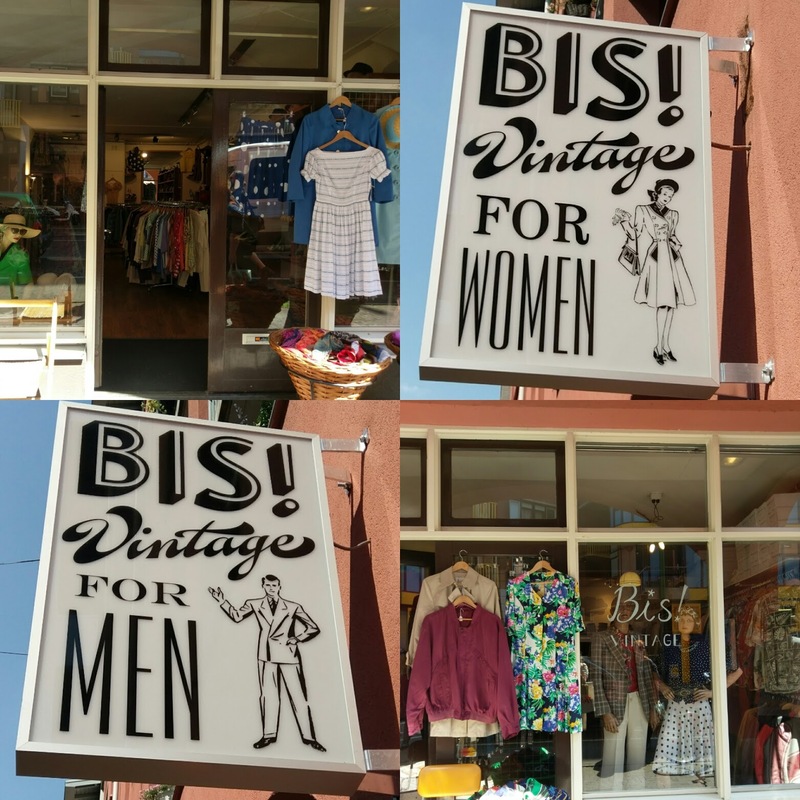 Another well known vintage shop. 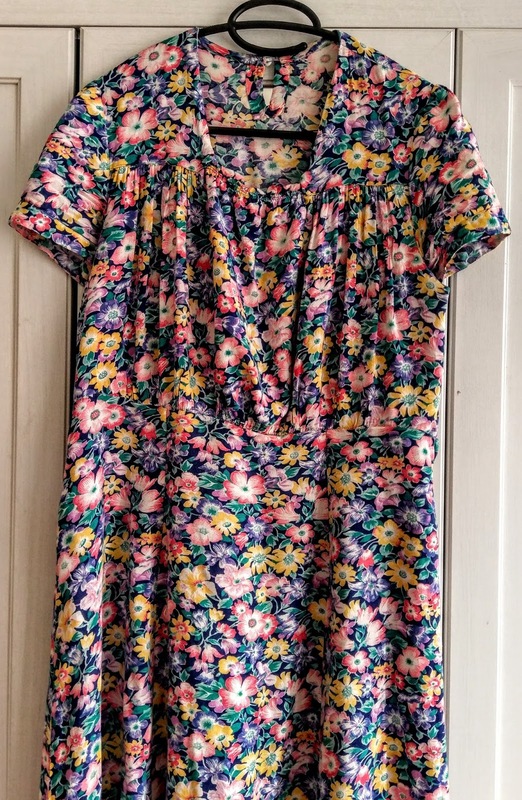 It used to be one of my best adresses but there seem to be fewer and fewer 'older' dresses here. 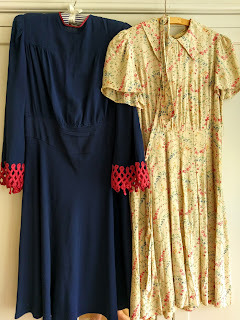 These are two of the dresses I've found there: cotton 1930's summerdress and a late 1940's rayon dress. Don't remember what I paid but expect to pay between 40 and 70 euro's for a dress. 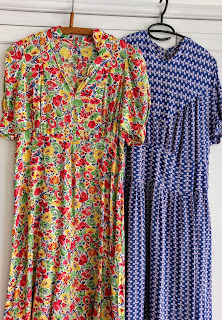 From all three Marbles shops this one might have most pre-60's dresses. They somethimes call them a 'special' but they hang between the other dresses. Best is to search through all of them (they are ordered by color). Prices at all their shops are good though, between 25 and 30 euro's. 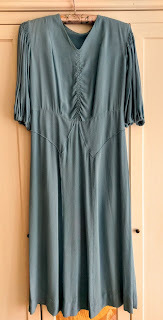 This early to mid 1930's dress was also labeled a 'special' from the 1950's ;) Think I paid 29 euro's. The Haarlemmerstraat/dijk has many more vintage shops, like for example Rumors. Have never found anything to my taste but could be worth to take a look when you there. Extra: If you happen te be in Amsterdam on an early Monday morning you could visit the Noordermarkt. 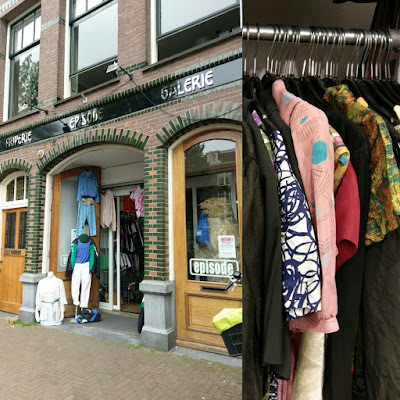 Every Monday they sell second hand clothes and fabrics. Be there around nine as the place is overflowing with people by 11. 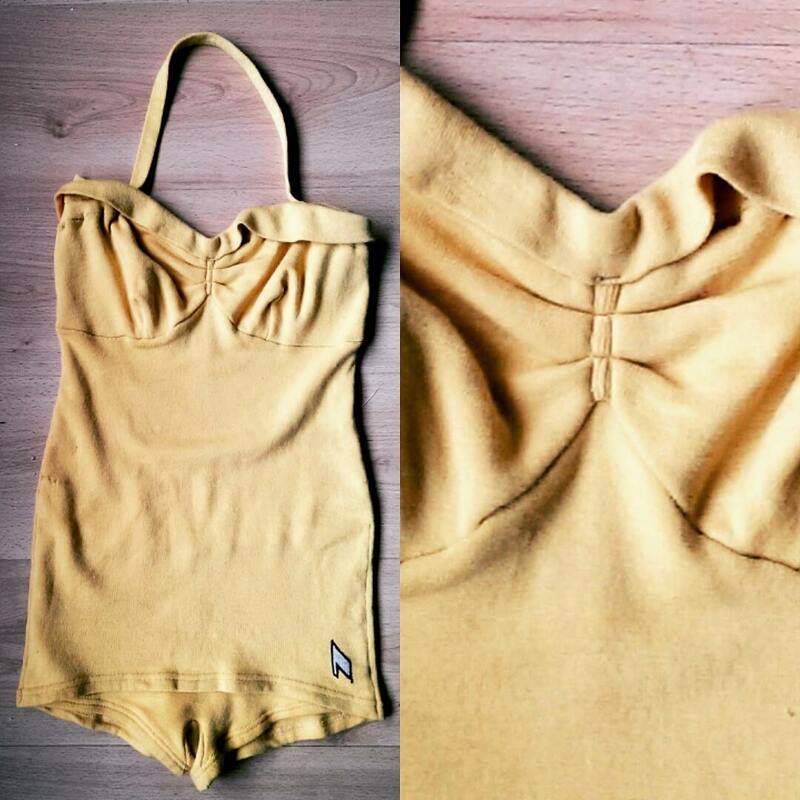 This concludes my personal vintage shopping guide. Hope it might be of help to any of you vintage lovers visiting Amsterdam! Dag Birthe, ik ben journaliste en heb een vraag aan je. Zou je mij willen mailen op l.vansadelhoff@gmail.com? Dank je wel!